Displaying 1 - 1 of 1 item(s) found. I learned how to crochet, knit and sew when I was only 6 years old from my mother, and I have loved it since then! I improved my skills along the years, learning from others and from my many trials and errors. I have no patience to wait to see the project done, so I like designing easy and fast projects. 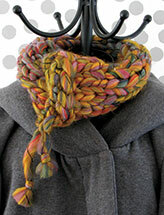 It can be crochet baby patterns, knitting with chunky yarn, and easy sewing patterns. I'm known for my very detailed step-by-step photo tutorials. I am using my skills as a pattern designer, a graphic designer, a photographer and a teacher to create tutorials that are easy to follow and friendly to all, especially for beginners and people who are not fluent English speakers. I'm also known for my paper craft designs and for mixing up some different materials and methods: I like crocheting fabrics, sewing papers and gluing yarn. I look around; indoor, outdoor, nature, colors -- they all give me more than enough inspiration for my many designs. Fall. When the weather gets a little cold I get my hooks and needles ready, and stock up at the yarn shop! I create about 7 different designs each year, but since I'm creating step-by-step photo tutorials, the design takes a lot of time and steps until the final PDF is ready. I never tried pottery and tatting. I should try those one day. Sunday afternoons are family time. My husband, kids and I like cooking together and making art projects. Beside yarn and hooks, I have scissors, a notebook and a pencil.